This memorial is not a glorification of war – more a record of the suffering it causes, and a recognition of people who gave their all (voluntarily and involuntarily). After the end of the American Civil War, Abraham Lincoln was seen talking with some Southern Generals. A woman is said to have asked him how could he calmly talk with them? They were his enemies, and he should destroy them. He reportedly replied: "Madam, when I make my enemy my friend do I not destroy my enemy?" It is also a triumph of emotion over reason to automatically assume that all who fought for us were heroes. Some people with a cruel nature found the military the perfect career option. Others joined because it was a way out of, or avoiding, jail. Mistakes and misdemeanours were often covered up for "the honour of the regiment". However, the majority who served were decent people who had unblemished records, while some others found redemption and honour (in keeping with literary classics, like A E W Mason's Four Feathers and E W Hornung's Raffles character, which have a central theme that disgrace can be erased by death in battle. A theme that continued even after WWI – P C Wren's Beau Geste). Sadly, technological advancements led to civilians in their homes being deliberately targeted from WWI onwards. So, it is not just military personnel who have lost their lives in conflict. Terrible as war is, each person has only one life (unless you believe in reincarnation), to sacrifice it in the service of one's country is to give your all. No man or woman can do more. And it is fitting that we recognise and remember those who made the supreme sacrifice – for their generation, the generations that came after, and those yet to come (and do what we can to avoid future conflicts). The Boer War, also called the Second Boer War or South African War, lasted from 11 October 1899 to 31 May 1902. British forces fought those of the South African Republic (Transvaal) and the Orange Free State. Around 100,000 lives were lost – including many civilians (and about 20,000 British troops). A large number of the casualties were due to disease rather than actual combat. Colonel Viscount Cranborne, MP for Rochester (later 4th Marquess of Salisbury), led the 4th Battalion, Bedfordshire Regiment (Herts Militia) to war. During the unit's active service in South Africa, their colours were kept in the private chapel of Hatfield House. Viscount Cranborne received a rousing welcome back from the people of Hatfield when he returned from active service in November 1900. The eight men from Hatfield who died in the Boer War dead are commemorated by a stained-glass window and a panel by the altar of St Etheldreda's Church. World War One lasted from 1914-18. While the bulk of the fighting took place in Western Europe, there were limited engagements in Africa and naval engagements took place across the Atlantic and Indian Oceans. While soldiers from across the British Empire – from as far away as Australia, Canada, New Zealand and India (1.3-1.5 million men served, including many from those regions which later became Pakistan and Bangladesh. Several thousand died on the Western Front, particularly at Neuve Chapelle where there is a permanent memorial) – enlisted to fight under the British flag, adding a further global dimension. Ironically, Japan, a Western Powers' ally, agreed to hold German prisoners of war, which led to them developing relations with Germany and eventually becoming their allies in WWII. For information on Hatfield's role – please click here for the feature Hatfield in WWI. Flanders, Hill 60, Gallipoli, Somme, Jutland, Thiepval, Ypres, Arras, Vimy Ridge... Men from Hatfield fought, and some died, in the key battles of WWI. They served with distinction in all the main branches of the British Armed Forces, and many were decorated for their bravery. Please note: unfortunately, the records aren't always clear or consistent. Some are listed as having died of wounds, others simply that they died in hospital. Some are listed as Killed in Action, others simply as killed (possibly, they may have been killed in accidents or by 'friendly' fire). Three sets of data have been used to compile this record. The main source was a memorial and roll of honour in the form of a bound book given to the families of the deceased and returning serviceman from the Parish of Hatfield. Entries have been cross-referenced against the Hatfield War Memorial and the Commonwealth War Graves Commission (CWGC) database. Variations and/or additional information to the book entries – excluding medal awards – are entered in brackets. NOTE (26.10.11): there are a number of Bedfordshire Regiment and Hertfordshire Regiment casualties listed in the 1921 Casualty Rolls not mentioned on the Hatfield War Memorial or Memorial Book, which only list Hatfield Parish casualties (and not Hatfield District). Please note: these lists include a number of individuals whose names are recorded on Welwyn Garden City memorials. As Welwyn Garden City was only founded in 1920, after WWI had ended and parts of Hatfield Parish (like Handside and Hatfield Hyde) were transferred to that newly created town in 1927, it is more accurate to describe them as residents of Hatfield or the Parish of Hatfield. Medal abbreviations: DCM – Distinguished Conduct Medal; MC – Military Cross; MM – Military Medal, DSM – Distinguished Service Medal; MSM – Meritorious Service Medal; (some awards depended on rank – officers would be awarded the Military Cross, junior ranks would get the Military Medal). 2009 saw the deaths of the last British soldier (Harry Patch, 111) and the last British airman (Henry Allingham, 113) to see active service during World War I. So it is a poignant and fitting year to record the names of the men of the Parish of Hatfield who served in the Great War and returned alive, but have since 'shuffled off this mortal coil'. As survivors their names are not recorded on any of the town's war memorials, even though they were no less courageous or steadfast in doing their duty. Please note: these veteran lists are based on information in the Hatfield Memorial and Roll of Honour Book issued to families of the fallen and returning servicemen. Entries have not been cross-checked so the information needs to be treated with a degree of caution. The most widespread and destructive war in human history. Like the First World War, the number of dead will never be known. Estimates vary wildly from 35-60 million. Its most disturbing aspect was the industrial slaughter of human beings because of their race or disability by people who believed themselves to be the pinnacle of human evolution. Less methodical but no less terrible were the atrocities carried out in the East. In this conflict aviation and aerospace came to the fore. Most air forces started with biplanes still in their ranks but in six years it ended with jet aircraft and the atomic age. For information on Hatfield's role – please click here for the feature Hatfield in WWII. Dunkirk, Crete, Tobruk, El Alamein, Sicily, Anzio, Burma, Singapore, Caen, Holland, the skies over Berlin, and on and under the seas... men and women from Hatfield saw action in many theatres of war. Like their relatives in WWI (and there are a number of matching surnames) they did their bit in some of the most difficult and dangerous times the world has ever seen – many gave their all. Please note: lists are based on the names on the Hatfield War Memorial. They have been cross-referenced against the CWGC database which lists additional information. Discrepancies, where noticed, have been identified. Civilians were killed in three attacks on Hatfield during WWII. They are commemorated on a panel at the Hatfield War Memorial. Hatfield Park War Cemetery dates back to when Hatfield House was used as a hospital during World War II. The site, bordering the A1000 Great North Road, is a formal war grave and is maintained by the Commonwealth War Graves Commission. 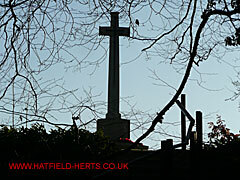 The memorial cross (shown in the picture at the top of this page) can be seen during the autumn and winter months from trains leaving Hatfield Station. The cemetery contains the graves of 20 serviceman and a de Havilland flight test observer killed along with John de Havilland (buried in Tewin Churchyard) on a test flight. There is also a memorial headstone for a serviceman buried in a 'redundant' churchyard in Digswell. Final resting place of 22 WWI and WWII era military casualties according to CWGC records. It is also the last resting place of at least 6 civilians killed in a German bombing raid on the de Havilland factory in October 1940. Six of the military casualties are not listed on the Hatfield War Memorial (possibly because they may not have been from the town. Others perhaps because they were post war and / or non-combat deaths). HMS Tweed was a River Class frigate sponsored by Hatfield following a successful Warship Week National Savings campaign in 1942. She was torpedoed and sunk on 7 January 1944. Of the 139 souls on board 83 officers and men perished with her. Few, if any, of the 56 survivors of the sinking are with us today and are also remembered here. For more information – please click here for the feature HMS Tweed (K250). At the time of writing in September 2009, the only known Hatfield victim of war and terrorism is commemorated on a panel by the altar of St Etheldreda's Church. The Lebanese Civil War lasted from 1975-1990. Although called a civil war it had an international dimension with US, Israeli, Palestinian and Syrian interests involved. An estimated 130,000-250,000 people lost their lives. Most were civilians. Clark Todd was the London bureau chief for CTV (a Canadian company), and lived with his family in Old Hatfield. He was in Lebanon covering the Israeli invasion, and was fatally wounded by shrapnel from an artillery round. He received a number of awards for his work, including: Overseas Press Club of America Award for Best Documentary (1977); Amos Tuck Award for Best Economic Reporting (1978); Bagriel Award (1979), Peabody Award (1979), and a posthumous Michener Award (1983).